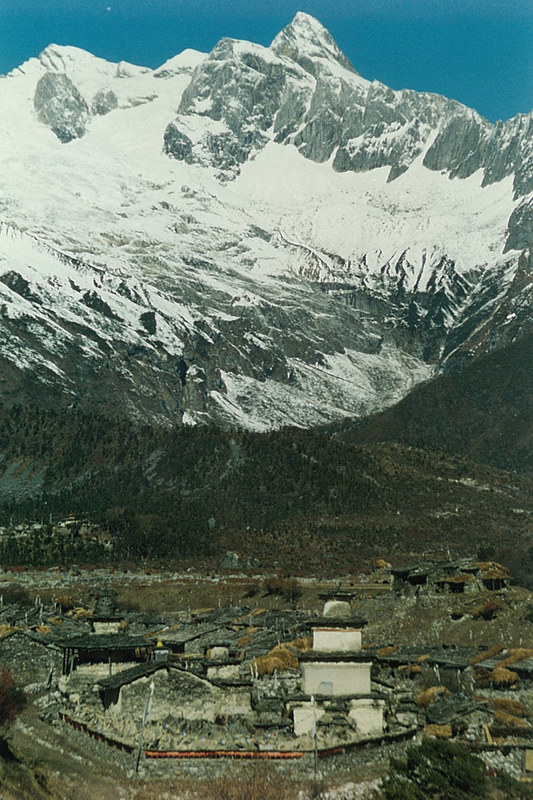 One of Nepal’s most exciting treks circumnavigates the world’s eighth highest peak, Manaslu (8,163 m), and is one of the most stunning and beautiful treks with peaks, valleys, pastures, villages and ever changing scenery. 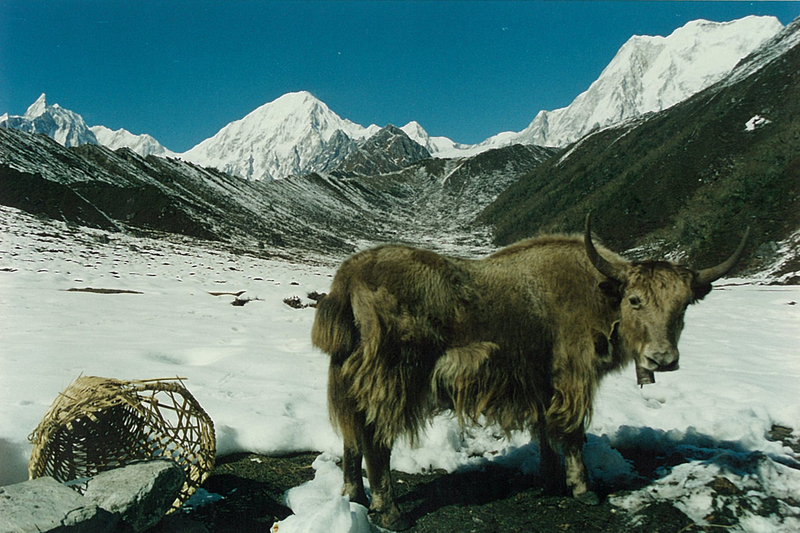 The attraction of these under-trekked trails and the high mountain scenery is hard to resist. Highly recommended. 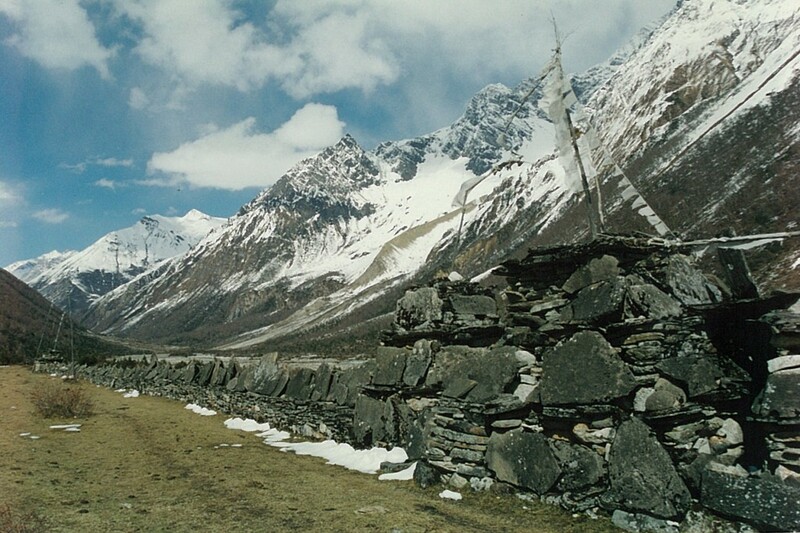 This trek, the first 4½ days of which overlaps with the Tsum Valley Trek, gives an insight into both Nepalese Hindu and Tibetan Buddhist cultures. 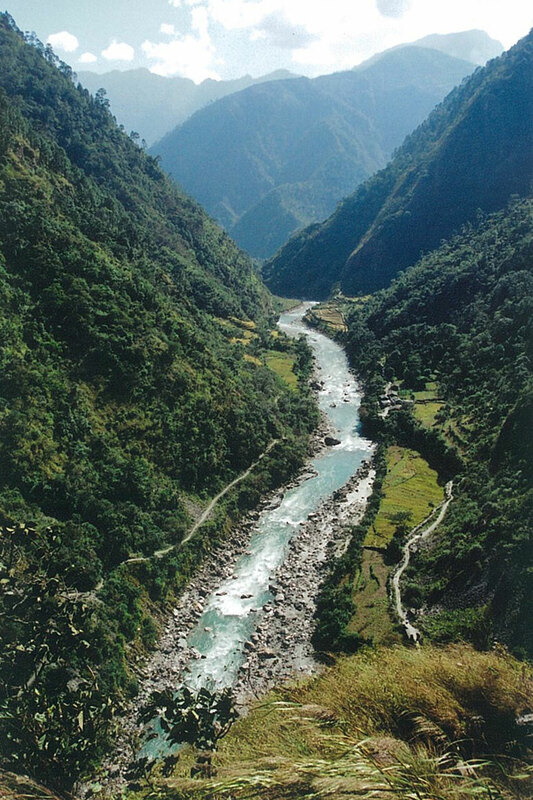 Leaving behind the historical towns of Gorkha and Arughat Bazaar the trek follows the deep blue waters of the Budhi Gandaki (river), entering a wild gorge that cuts between Ganesh (7,429 m) and Himalchuli (7,893 m) and where villages are linked by precipitous trails. 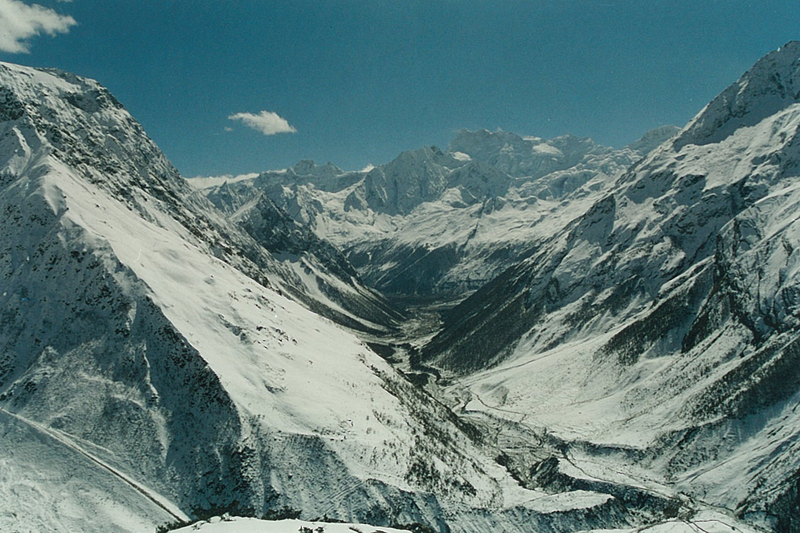 We then enter a u-shaped glacial valley with stunning views of great Himalayan peaks. 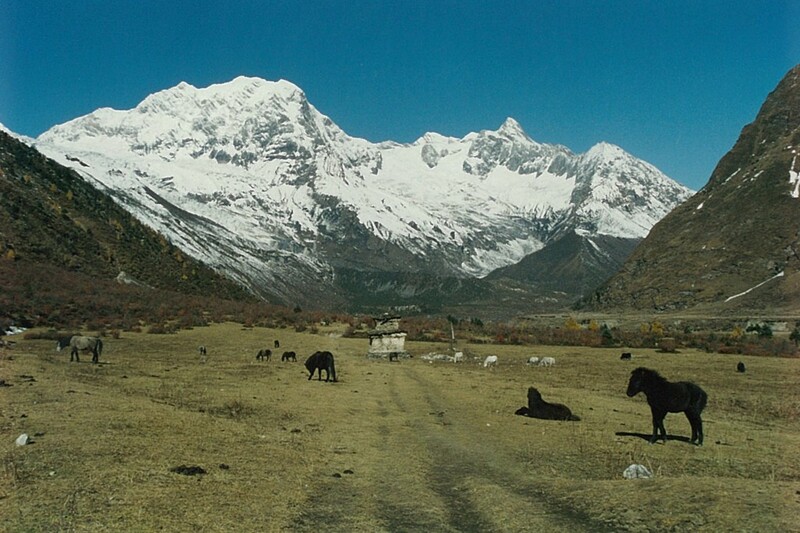 Conservation in the area has been achieved by the monks implementing a hunting ban and this valley is now a sanctuary for snow leopards, grey wolf, musk deer, blue sheep and the Himalayan tahr — over 110 species of birds, 33 mammals, 11 butterflies and three reptiles have been recorded. 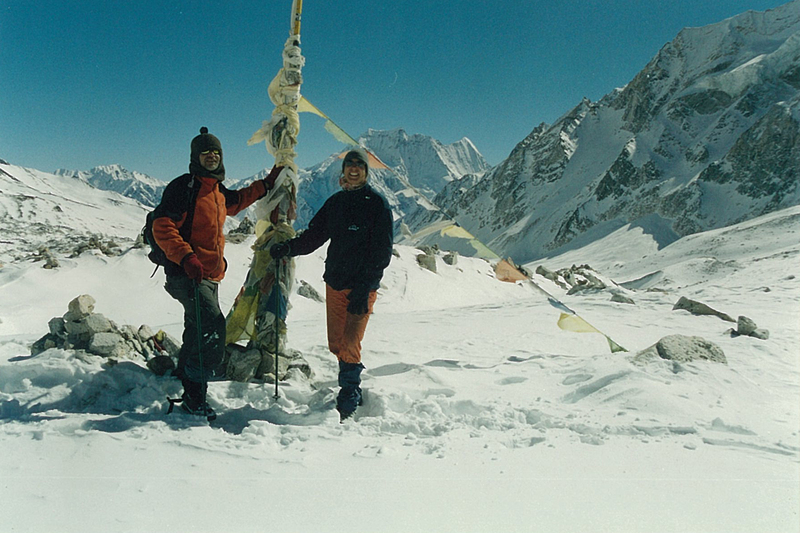 We finally reach the stunning Larkya La (pass) (5,133 m) and descend to Dharapani from where we do the first two days of the Annapurna Circuit Trek in reverse. The recent addition of a tea-house just before the long crossing through the Larkya La means this can now be done staying in accommodation, though camping may still be the better option and is a must for larger groups. 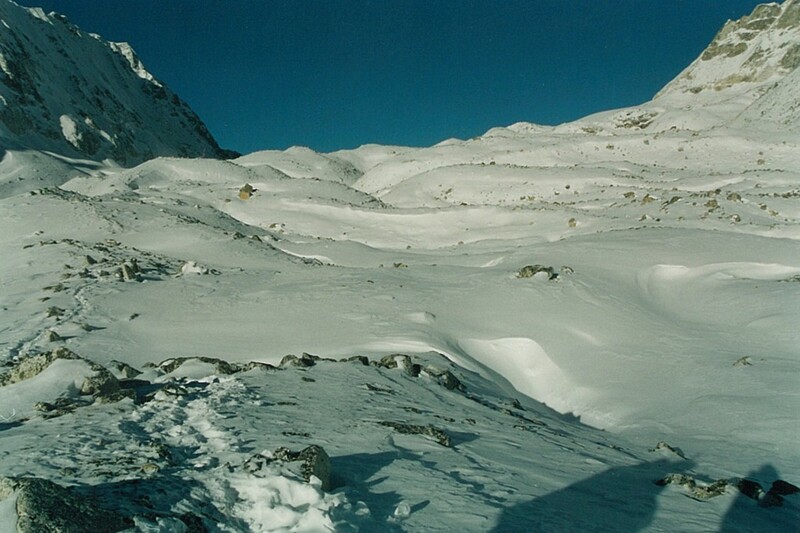 This trek is best done in October or November, but could equally well be done from March to early May. If you have an additional 2 days to spare a great alternative is to start the trek at Manakamana and hike from there to Gorkha and then spend a day trekking from Gorkha to Arughat. This is both a fascinating hike that other trekkers don’t see and a good opportunity to get fitter before you start ascending. Day 1 Kathmandu to Arughat Bazaar (535m) Your trekking guide will arrive at your hotel and, after breakfast, we drive from Kathmandu to Arughat Bazaar by the Budhi Gandaki River. (7 hour drive). Day 2 Arughat Bazaar to Soti Khola (710m) We trek through Gurung and Magar villages, alongside the river through bird-filled forests with monkeys and waterfalls, to Sante Bazaar with its overhanging pipal tree. It can be hot and humid and rice, maize and millet are the main crops here. We hike up stairs as the valley becomes wilder, prettier, steeper and narrower as it approaches Arkhet. We trek through fields, over a ridge, down to a waterfall up to a ridge at Kyorpani and hike down to Soti Khola (710m), where there’s a swimming hole popular with locals. 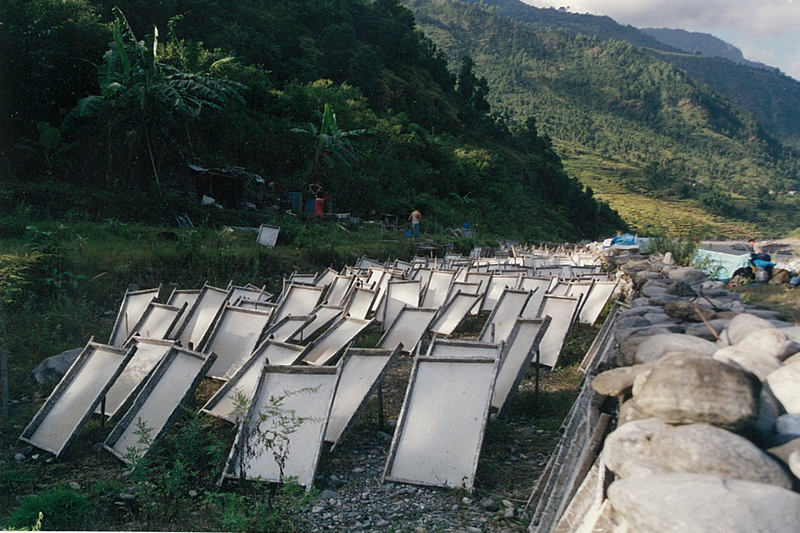 This Gurung part of the valley is famous for its bees and honey. (6 hour trek). Day 3 Soti Khola to Machha Khola (930m) From Soti Khola the trek passes through forests of sal trees en route to Khursane. From Khursane we hike up past 2 waterfalls cascading down, and emitting fine spray through which the light forms spectacular rainbows, on a steep trail clinging to the cliff face. We’re now starting to enter the spectacular Budhi Gandaki Gorge and the trek seems to go up and down faster than… you can blink. 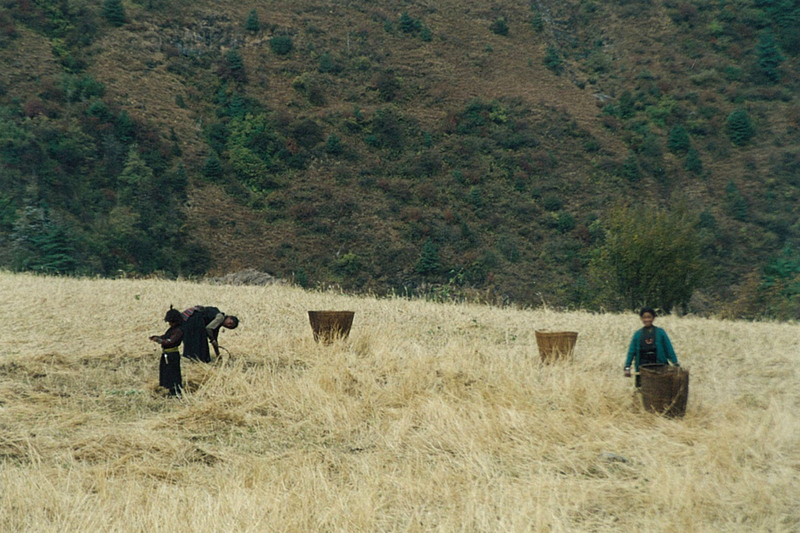 Finally the trek winds its way past rice terraces to the Gurung village of Lapubesi. 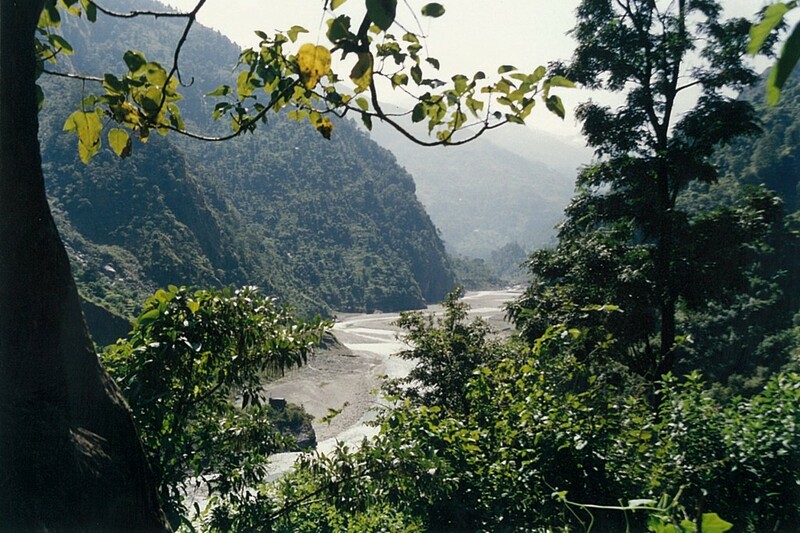 After a brief upward hike the valley widens and the river meanders to the village of Machha Khola. (5 hour trek). Day 4 Machha Khola to Jagat (1,410m) We trek up and down and across sandy river-flats, the monkeys and langurs in the jungle above can knock rocks down, so watch out. 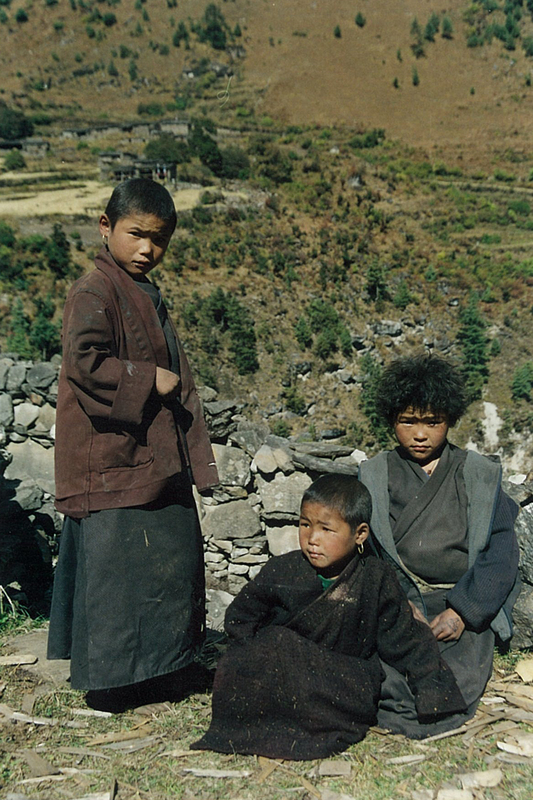 The large Gurung villages are way above and the trek passes few houses (lower Khorlabesi was largely destroyed by a huge rock slip years ago, though a survivor has built a botanic garden and a lodge from which he sells his organic coffee). Goat-herders passing through this area wear the distinctive smoke-browned capes called bokkhu made famous in the book “Honey Hunters of Nepal” and featured in a BBC documentary “Jimmy and the Wild Honey Eaters”. We trek up and down over a couple of ridges to Tatopani (930m), where there are hot water spouts under the sheer cliffs. We trek up over a ridge and hike across the Budhi Gandaki on a rickety suspension bridge, trek up marble stairs and hike through Doban (1,000m). After an hour there is a large rock where we can take tea and look at the wild gorges ahead. Hiking across a landslip and then a bridge over the Yaru Khola (1,363m) we emerge onto river-flats at Yaru (1,140m), where we should look downstream and notice the massive rockfall that chokes the river. Just past Yaru we hike across to the left bank and enjoy an easy up and down trek to Jagat (1,410m), a pretty flag-stoned Gurung village. In this area, potato, maize and climbing beans are all planted at the same time – the potato for food and to suppress weeds, the maize for food and to supply a trellis for the beans, an important source of protein – marijuana is a major weed here. (6 hour trek). Day 5 Jagat to Bihi Phedi (1,990m) We trek up the riverbed and hike over a rocky ridge to Salleri (1,440m) catching magnificent views of Sringi Himal (7,187m) and then trek down to Sirdibas (1,430m), where we’ll see our first signs of Buddhist culture. 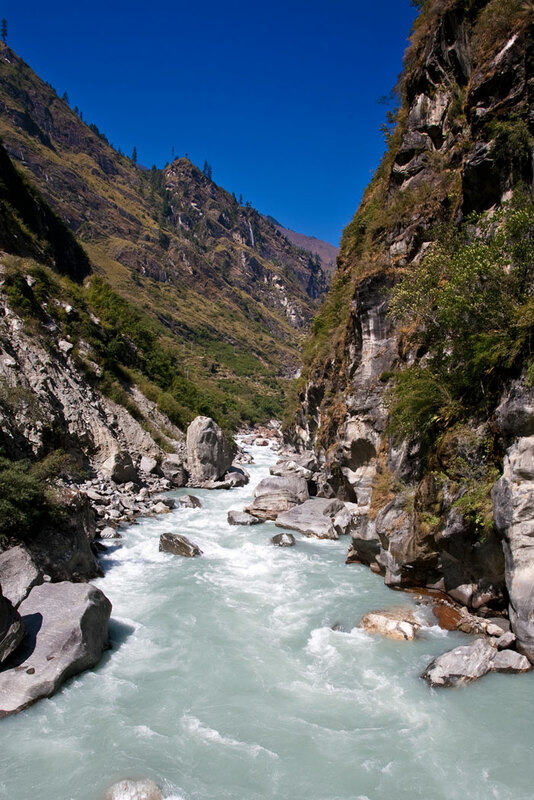 We trek up-river before crossing Nepal’s longest suspension bridge and making a tiring hike up to the prosperous Gurung village of Philim (1,590m), which is set amidst fields of maize, potato and millet and groves of alder, azure pine, poplar and oak. We trek past Ekle Bhatti and enter a precipitous gorge, hike over grassy slopes dotted with pine trees, cross the Budhi Gandaki before a pleasant trek through bamboo forests to the small village of Deng. 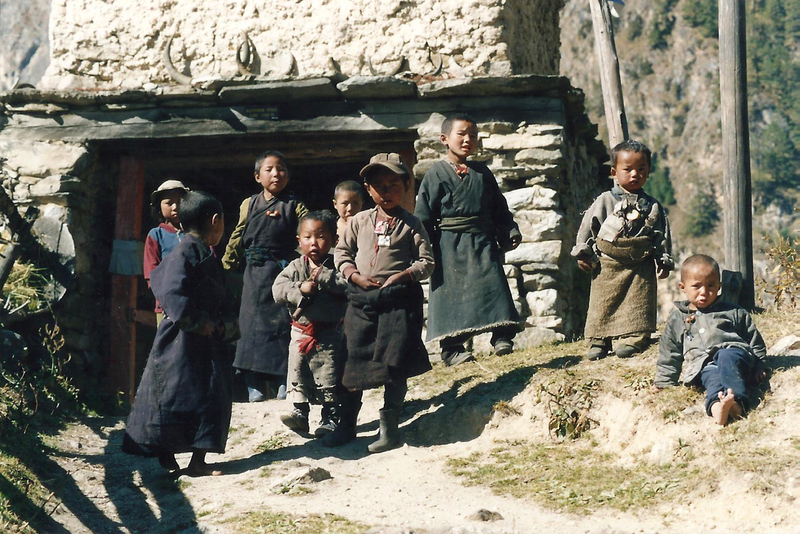 Here we are hiking into an area occupied by Buddhist-practicing Gurung. 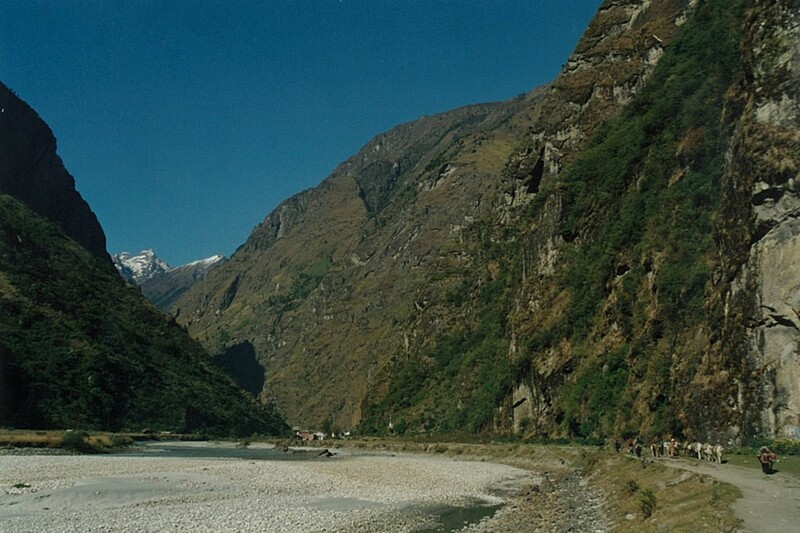 We re-cross the Buri Gandaki, trek up to Rana and hike past Shringi Gompa (monastery) to Bihi Phedi. (7 hour trek). Day 6 Bihi Phedi to Namrung (2,660m) We trek down into the Sringi Khola Valley and cross the river before hiking through forests until we reach the corn and wheat fields of Ghap. You are now entering the mountains proper and the nights will be pleasantly cooler. 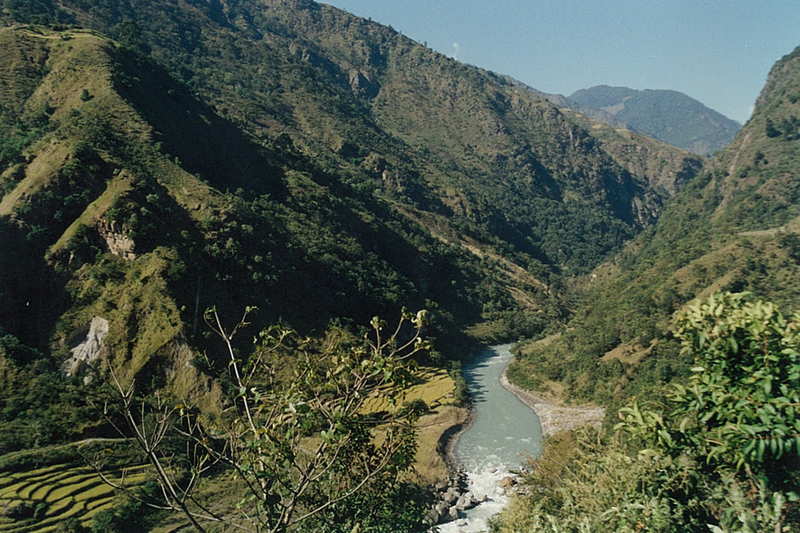 We trek up through forests of fir and rhododendron, where we may spot Nepal’s national bird, the Himalayan monal, criss-cross the Budhi Gandaki before hiking through more forests of rhododendron and bamboo. 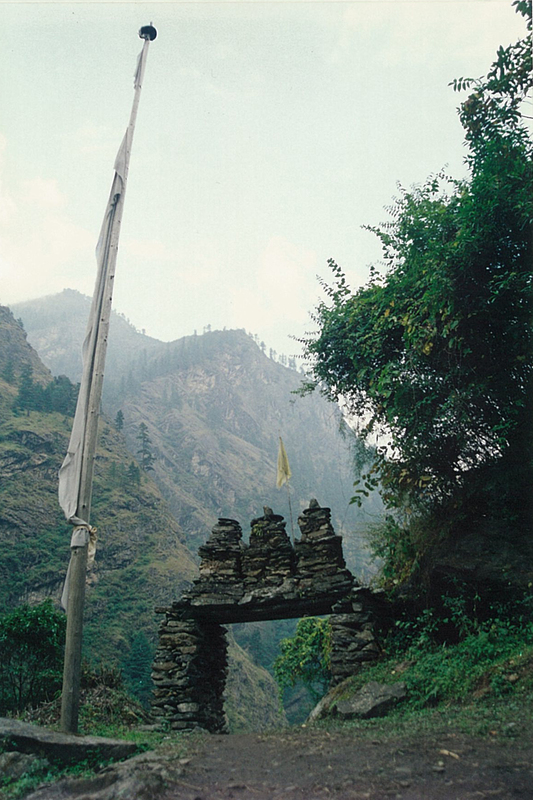 We then hike into picturesque Namrung through a stone kani (archway). (6 hour trek). Day 7 Namrung to Samagoan (3,180m) We have now entered an area heavily influenced by Tibetan culture and the environment has changed, the cliffs are disappearing, we are trekking into a u-shaped glacial valley with views of Manaslu (8,163m), Manaslu North (7,157m) and Naike Peak (5,515m). We hike up through forests of fir, rhododendron and oak, through a kani and into the wheat fields of Lihi, where there are a couple of gompas. 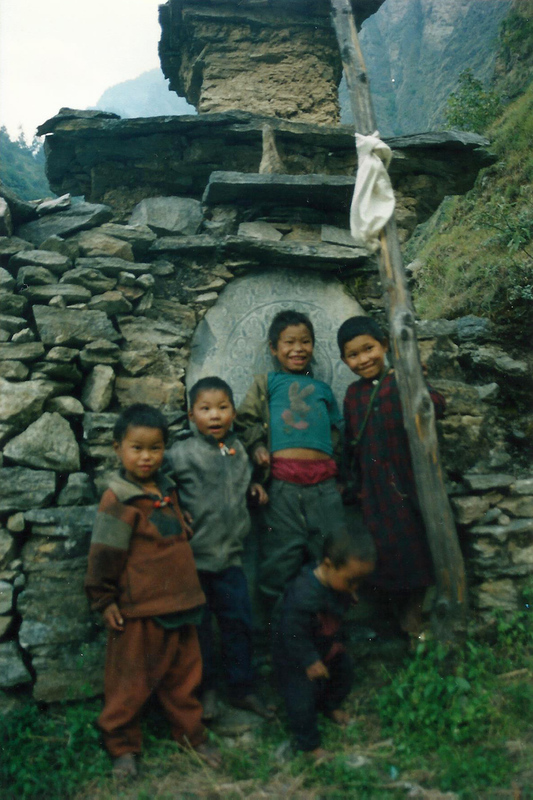 We exit the village through another kani and trek through a wooded canyon, we hike over the Hinan Khola, go through another kani and enter the village of Sho, we then hike cross a ravine and trek up to Shrip. NB the platforms in the fields are watchtowers from which people scare off crop-raiding bears. 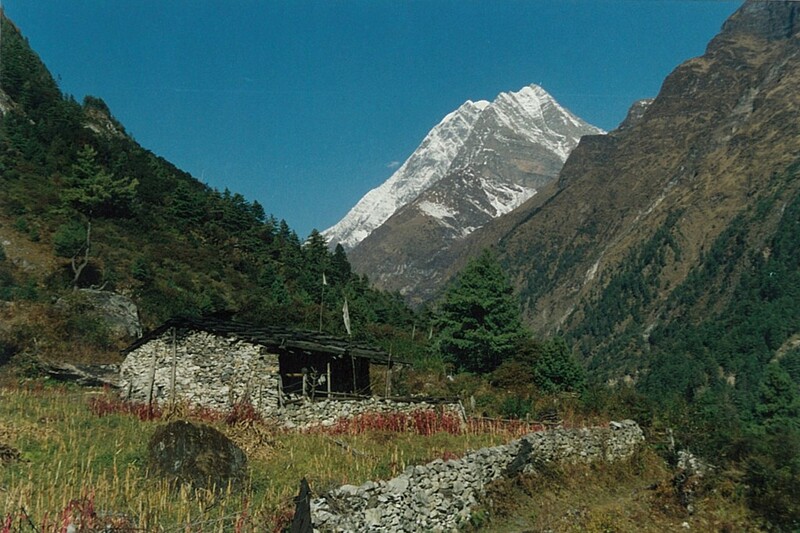 From here we hike up to the village of Lho, trek through damp forests and emerge onto a plateau at Shyaula (3,520m) with views of Himalchuli (7,893m), Ngada Chuli (7,879m) and Manaslu. We hike across a ridge and follow the Thosang Khola before emerging onto another ridge and the hauntingly beautiful wide pastures of Samagoan. 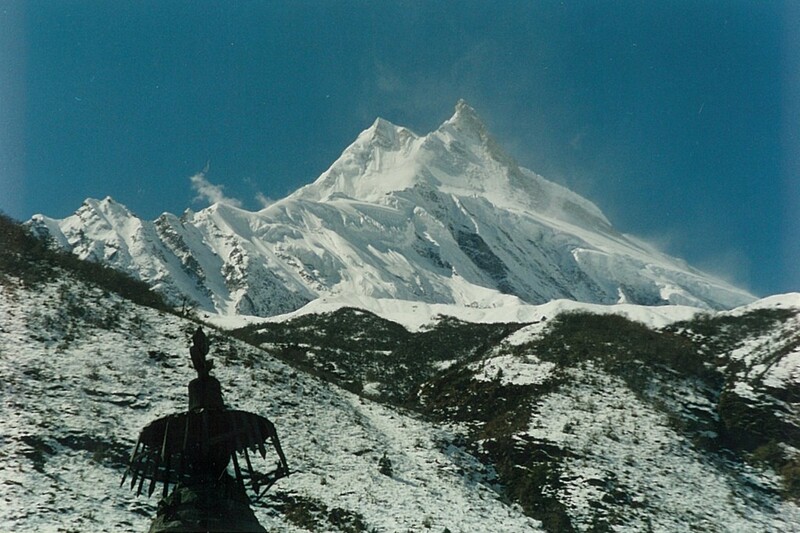 Arriving at lunch leaves us enough time to visit Pungyen Gompa and Manaslu Glacier Lake (Birendra Tal). (4 hour trek plus side-treks). Day 8 Samagoan to Samdo (3,860m) We make an easy trek past juniper and birch forests via Kermo Kharka to a ridge from which we hike down to cross the river. After a further trek up we reach the confluence of the Budhi Gandaki and Shyale Khola valleys and the village of Samdo, a Tibetan refugee settlement beneath the soaring summit of Pang Puchi (6,335m) and the last permanently occupied place in the valley. 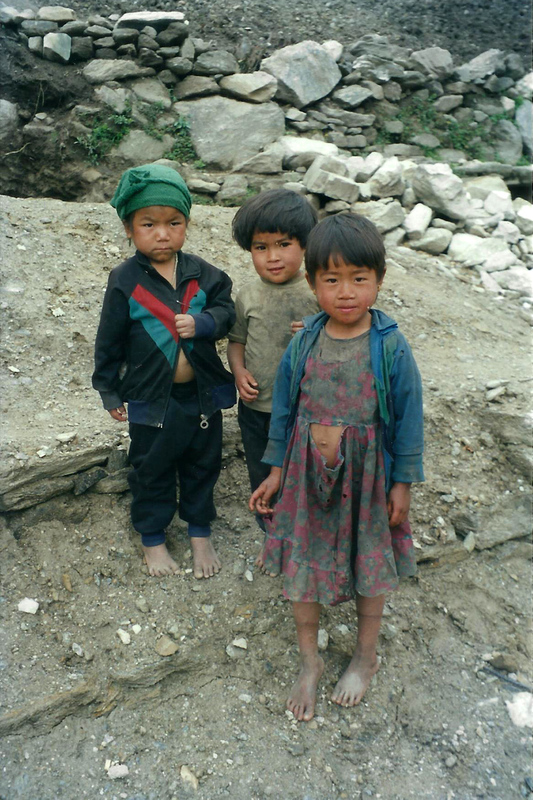 Tibetans still cross the border from here as pilgrims, traders and smugglers. (3 hour trek). 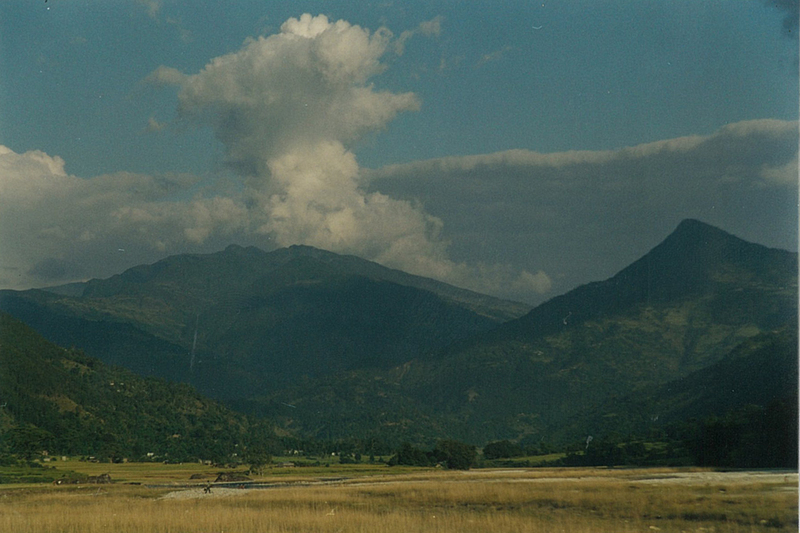 Day 9 Samdo – Tibetan Border – Samdo We take an interesting 8 hour side-trek to the Tibetan border. Your guide will take you and provide lunch etc. (8 hour side-trek). Day 10 Rest Day We take a rest day so you can further explore the area. 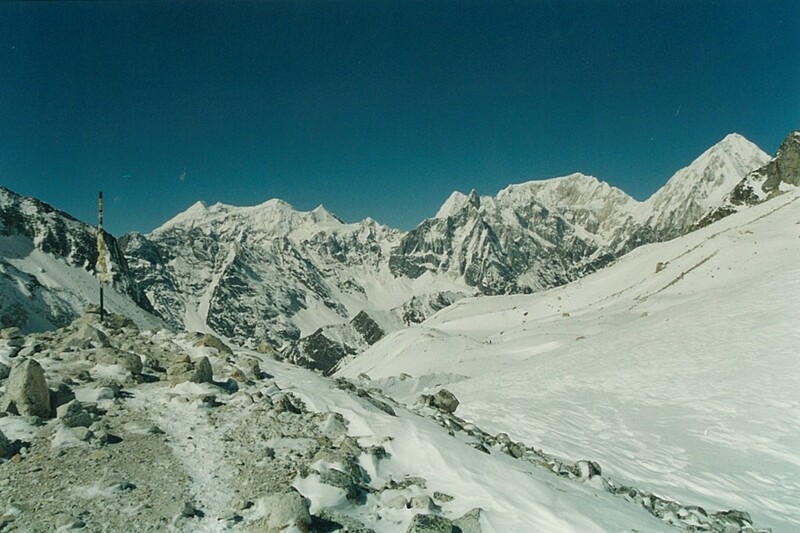 Ask your trekking guide for advice. Day 11 Samdo to Larkya Guest House (4,480m) Now we trek down to 3,850m to cross the Budhi Kandaki before hiking up through juniper and tundra in and out of ravines toward the Larkya Guest House, the last stop before Larkya La (pass). (4 hour trek). Day 12 Larkya Guest House to Bimtang (3,720m) We’ll start early morning, so keep your torch handy, to begin the long spectacular trek over countless false ridges to the prayer flags, cairns and spectacular views of the Annapurna Massif that mark the high point of the Larkya La before beginning the steep hike down to Bimtang. (8 hour trek). 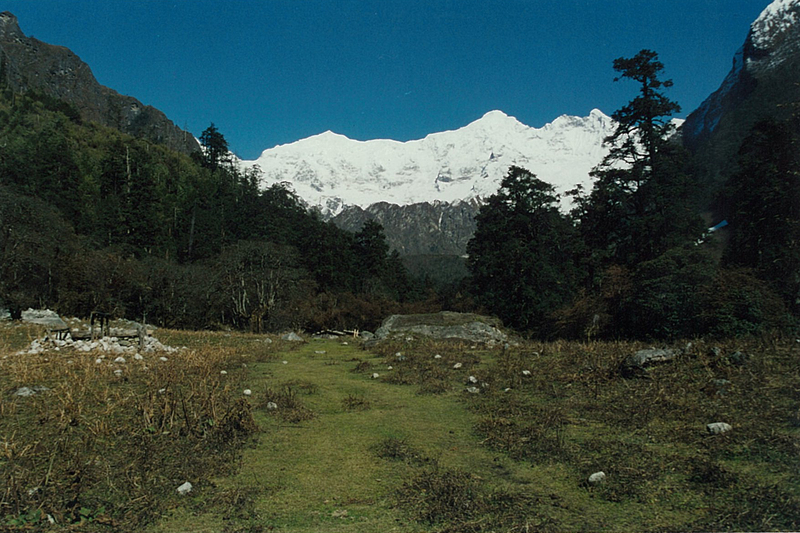 Day 13 Bimtang to Dharapani (1,920m) From Bimtang we can trek all the way down through the forests and pastures of the Dudh Kolah Valley to Dharapani where we join the more popular, but, sorry, less spectacular, Annapurna Circuit Trek. (8 hour trek). Day 14 Dharapani to Jagat We trek down the Marsyangdi Nadi gorge to Jagat. (6 hour trek). Day 16 Bhulbule to Kathmandu We drive back to Kathmandu. (6/7 hour drive). 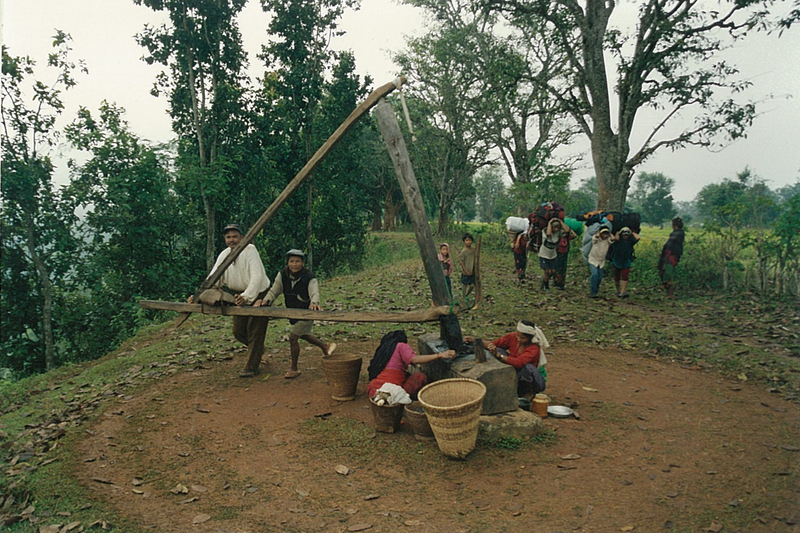 Price US$ 1,600 including transport to and from Kathmandu to the trek, but not accommodation in Kathmandu and Pokhara. 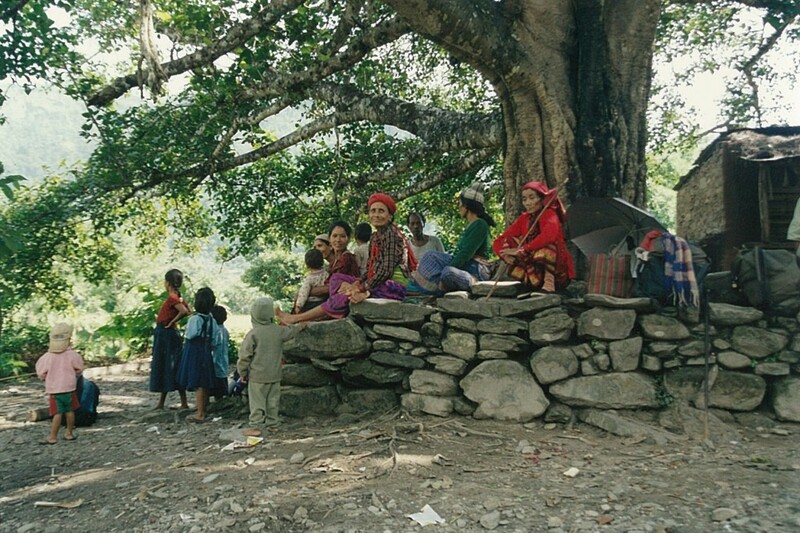 This price is valid for both tea-house and camping treks, though less than 4 campers would cost more per person. Price includes Airport pick-ups and drop-offs, all inclusive trek costs; accommodation in twin shared rooms or all camping costs, breakfast, lunch, dinner, trekking and park permit fees, transportation, guide and necessary porters and all their costs such as transportation, accommodation, food, equipment, insurance etc.